Water, water everywhere – and plenty for all to drink. New water fountains are being introduced – you can find one at the road below the Town Hall, for example. As well as making drinking water available for all, it should reduce the use of plastic bottles. A scheme “Ask Me I’m a Local” is to be introduced. Traffic has been something of a problem at the height of the season, so there are to be new measures to help relieve the problem. The municipality will build a new parking lot this summer. It will be temporarily and mainly for coaches but will be expanded to take cars in autumn 2018 and spring 2019. Information boards will be installed at the entrance to Bled, to direct traffic to free places in public car parks and there will be control panels from parks to the lake. and the introduction of a one-way traffic to Kolodvorska cesta, around Prešernova Cesta from the hotel Astoria to the Bledec hostel. Almost all Slovenians you will meet in Bled, Ljubljana or any of the main tourism towns speak or have a good understanding of English. Some younger people speak it as if it were their first language. They also often speak German and Italian (especially further north near Kranjska Gora), Croatian, and other Balkan languages. English is often used as a “bridge” language by other European and Asian visitors. Slovenians know that theirs is a difficult language. There are so many dialects even some Slovenians will not be understood throughout the country. 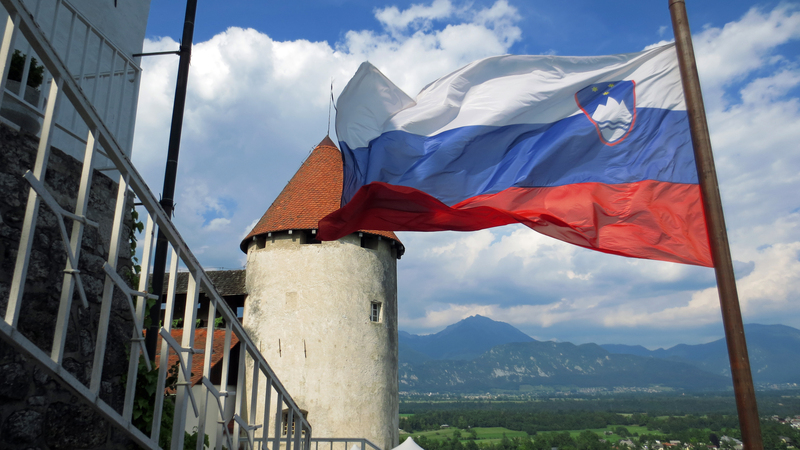 Learn a few words of Slovenian. It will be appreciated. There are some suggestions as we go through the book. Most independent travellers arrive in Bled by car or bus, which is where I begin this book. We all carry mobile phones. Many of us are constantly connected to the internet where we can grab instant information, maps, directions and phone numbers. The aim of this book is to curate and present the information you need when you are in Bled or planning a visit; information which is practical and relevant to most visitors but will save you the research time on the web. In this section, I want to keep the information as practical as possible for people arriving in the town for the first time. The bulk of the book is written from experience. It tries to answer questions with that experience and sometimes inside knowledge. Most people arriving by bus are travelling from Ljubljana or from the train station at Lesce where they pick up either a local service or join the bus from Ljubljana. Others come from the Bohinj direction going towards Ljubljana. If you are arriving from Ljubljana or Lesce, Radovljica, Kranj direction, once the bus gets to the top of the hill just as you come into Bled, you will get your first sight of the town. It is more than likely that the first stop is not for you unless you are going to Hotel Krim, Union or some of the hostels and apartments nearby. You are more likely going to the Bled bus station (Avtobusna postaja Bled). Some first-time visitors scramble to get off here at Union stop. The drivers are used to it and will announce this is not where you want to be. Some first-time visitors ignore the driver; he knows what he’s talking about, people. When the bus pulls into the station a few minutes later (often 19 minutes past the hour), you get off at the back door. If there is a crowd – and at the height of the summer, there almost always is – there is usually confusion. Some people wanting to board the bus will demand tickets to Ljubljana (usually at 30 minutes past the hour) – this bus is not for Ljubljana, it is going on to Bohinj Jezero, Bohinj Zlatorog or that direction. Slovenian bus destination boards can be befuddling on first sight. Until recently there were literally boards in the driver’s wind-screen. Almost all are now digital displays, although a few boards are still to be seen. The bus from Ljubljana to Bohinj Zlatorog will display “Ljubljana – Bohinj Zlatorog” and usually include Kranj’ Naklo, Radolijca and Bled. The first name on the display says where the bus has come from (Ljubljana) and the second, where it is going (Bohinj Zlatorog). Below that, smaller letters naming some of the towns it passes through. This can cause bewilderment among new visitors which is often expressed simultaneously in many European and Asian languages. The circumstances are compounded by co-incidences in the timetable. The Bohinj to Ljubljana bus arrives about the same time as the Ljubljana to Bohinj bus. As you get off, other people are milling about confused about getting on. Normally busses are keep to their timetables and are reliable, but with road works and extraordinary numbers of visitors in the summer, delays are understandable, but add to the confusion. Of course, other destinations are served from Bled, so there could be two or three other busses arriving around the same time. Read the destination boards. On a hot summer’s day patience is strained. I really admire the bus drivers who just take it in their stride, talking to the passengers, sometimes in three or four languages. Where is the coffee/beer/wine/cream cake? There are detailed answers to those questions later on but here are a few quick replies to the frequently asked questions. We will answer by taking a short walk from the bus to the Tourist Information Centre. When you get off the bus it doesn’t matter whether you turn left or right to get to the lake, either will do. If you go left at the bus, take the immediate right, if you go right take the immediate left. Thirty seconds walk from the bus and you are spoilt for choice. Caffe Peglez’n is a small traditional place with a big terrace. It is favoured by locals as well as visitors and is one of my top three places for coffee and calm in Bled. It’s on the right as you walk towards the lake. Art Café is modern and attracts younger clientele including students from the two nearby colleges. A wide range of drinks is available, as are snacks and in the winter excellent hot chocolate. Vinoteka Zdravljica is a few paces past the Art Café. It is stocked with about a hundred Slovenian wines. There is a dozen or so on the wine list to be bought by the glass. This place is a personal favourite. Sitting outside on a warm summer’s day watching the world go by, reading a book, looking up at the castle, sipping Rebula or Malvazija – Slovenian white wines … heaven. You can read more about Art Café, Vinoteka Zdravljica and Caffe Peglez’n and the other cafes and restaurants in the area in the Food and Drinks section. We say “Cheers” as a toast. Slovenians are more likely to say ‘Na zdravie.’ (“to health”). There it is; just past those cafés. And there is Bled Castle up on the hill. And there is St. Martin’s Church, and the island, and the view, and the swans, and ducks. Altogether, a great big helping of the Bled experience. Usually marked, for your convenience (sorry) as WC or sometimes “Stranišča”. As you would expect, the cafés and bars have toilets. From the bus station, the nearest public toilets are just past the Festival Hall (Festivalna dvorana) on the left just as you get to the horse drawn carriages (fijaker). You’ll need a 50-cent coin or 10 and 20-cents to the value. There are other public toilets in the main Shopping Centre. By summer 2018 there will be eight public toilets in the town and around the lake. If you only have bank notes, there is a change making machine at the carpark beside the shopping centre. There was one beside the fijaker, but no longer. First time visitors to Slovenia often remark on how clean the country is. And it is. That cleanliness extends to the toilets. They are spotless, well maintained and safe. Where is the Cash Machine, the ATM? Walk on, toward the shopping area about 200 meters and you will see the Gorenjska banka ATM. he bank has moved but the cash machine remains. There is another machine at the shopping centre at the SKB. Along the way, you will pass the beautiful town hall on the left. Once you have your cash, walk along a little further for the Park Hotel, the home of Bled cream cake, more coffee and one of the best views over the lake toward the castle. Where is Tourist Information? After you leave the Gorenjska Bank cash machine (bankomat) continue to walk toward the Casino. There is a sign for tourist information to the right. You can get maps and books, gifts and advice. There is also bike and car hire here. Infocenter Triglavska roža is about a 10-minute walk away at Ljubljanska cesta 27. When you reach the Park Hotel (on your left) turn left and keep going. The Infocenter is on your left. Where can I hire a car? It will probably be less expensive if you can book a car before you arrive on the car hire website. There are several advantages to this. First you can compare prices (there are up to 6 agents in town), arrange to pick up from Bled and return to the same place or another rental office – there is usually no charge for that. Beware, though, of costs not obvious or you are not informed of right up front. I had used Eurocar for years. Last time in May 2018 I paid full insurance when I hired a small car. I scrapped two wheel covers during the hire – inexpensive to replace. No matter, insurance would cover that. Yet I was stung for £60 “administration”. I will be checking “administration” costs next time I hire a car. Where’s good for lunch? There are lots of places to eat. In the food and drinks section I nominate the best places I have visited. There is a more exhaustive list if you want more information. If you are under pressure and just want a quick snack by the lake, then the Mercator in the shopping centre is the place to go to buy sandwiches, cheese, bread, fruit and drinks including wine and beer. There are two main departure points; Bled Bus Station and Union stop on the main road the Ljubljana, away from the town. As mentioned in the “Arriving by Bus” section, things can become a little confusing during the summer as people from half a dozen different countries try to work out if this is the bus they want. Bus destination display show (first) where the bus started its journey and the destination (second) with some other places between the two names. To add to the confusion at the station, buses going to Ljubljana and from Ljubljana arrive within minutes of each other. The other bus stop, opposite the Union restaurant is for Ljubljana. And finally, Bled bus station serves other destinations, nearby towns and villages. It can become quite busy. When is the bus to Bohinj? Kdaj je avtobus do Bohinja? When is the bus to Ljubljana? Kdaj je avtobus v Ljubljano? There are two train stations serving Bled, which is not the same as saying there are two train stations in Bled. There are not. Bled Jezero railway station, which is on the line from Jesenice to Nova Gorica, is high above the north-western side of the lake. It is not well placed if you are going to the town or the hostel and hotel area. It is almost 3 kms from the town centre. The main camping ground is much closer – 10 minutes or so down a steep hill. Hotel Triglav is very close to the station. The line continues to Nova Gorica on the Italian border. Services are infrequent, but it is a beautiful journey. It makes a lovely day out. Several times a year, an historic railway journey is played out from the station. See more about The Heritage Train in Part 7 of this book. I have noticed people take the train service from Ljubljana to Jesenice and not get off at Bled-Lesce which it passes through. They change trains Jesenice in and then travel to Bled Jezero. That whole journey is about 3 hours. You might think it makes sense to you and your arrangements, particularly if you are going to the camp site. Bled-Lesce railway station is 4 km from Bled. You can catch a bus to Bled (and other destinations) across the road from the railway station. The service from there is good and frequent during the day. However, in the evening and on Sundays there can be long gaps between buses. The journey is about 10 minutes stopping at Bled Union and Bled bus station. It takes about an hour to walk. I imagine you could rent or buy a bicycle from the large cycle shop near the station. When all other alternatives are exhausted, you can get a taxi. Taxis from Lesce to Bled are expensive. Be prepared to pay €15 for the ten-minute 4 km trip. The last time I took a taxi from Lesce to Mlino the charge on the meter was a few cents short of €20 (December 2016). Parking can be difficult. At the height of the summer 2017, there were stories of long tailbacks into the town from the highway, impossible to find parking space. A long-awaited by-pass is currently under construction and should be ready in the early summer 2018. Until then Bled’s through traffic to Bohinj and Pokljuka will remain heavy. There are also plans to build a new car and coach park close to the main entrance to Bled Castle. In 2018 there will be a coach park, and then develop into a coach and car park. That should be in full operation in 2020 and will take a lot of pressure off the town’s infrastructure. As he drives me from the airport my friend Luka says, “We need a carpark here.” We are just passing the entrance to the new Mercator. “People could park here are and walk to the lake or there could be a tourist train or shuttle.” He is quite right. Bled needs more parking. Personally, I would avoid arriving by car at the height of the summer, especially at the weekend. Until that new car park is available, it might even be worth parking in Lesce and taking the bus into Bled. This is not a recommendation, merely a suggestion from someone who has been stuck in a long tail of traffic on a hot summer day. If you arrive by car you will probably come via one of three directions, the Ljubljana/Jesenice highway, from Bohinj or possibly from Vintgar Gorge. On a hot busy weekend, I wish you luck. There are lots of parking places, but they fill up quickly. There is parking along cesta Svobode from around about the bus station and in front of Festival Hall. But that is more limited now. Don’t rely on it. And it is not suitable for camper vans. The roads around here are too narrow, and people walk here. There is more parking beside the Sports Stadium, behind Vila Prešeren, behind Hotel Krim and a few other places. If you can’t find somewhere easily, I suggest going out of town – not toward Mlino, you have no chance there, but toward Ljubljana. Many of the parking places have limited time allowances; as little as 30 minutes, often 2 hours. The two main petrol stations are on Ljubljanska cesta on the road towards the highway. If you plan to visit Mlino, there is a large abandoned building just past Vila Bled. The space around it is used by tour coaches for parking. You might find some room there. But the time allowance is limited. The walk all the way back to the town centre is about 25 minutes. But what a walk. Breath taking. You will see signs outside many of the bars and restaurants here in the Gorenjska region welcoming bikers. Touring bikers are often seen on the winding mountain roads. Harley Davidson clubs meet in Bled during the summer and thunder through the mountain roads nearby. The information for bikers is the same as everyone else, but you might want to prioritise places where bikers are particularly welcome. You have a better chance of meeting like minded people and get advice and suggestions for your visit. Now you have arrived and dealt with personal needs like laundry, cash, coffee, and cake, you can start exploring.